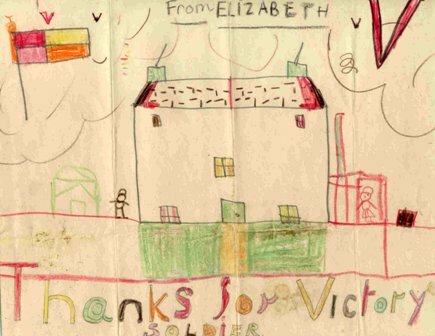 The following image is a touching one taken from the Elizabeth Harwood collection. Elizabeth drew this picture celebrating the end of World War Two when she was approximately 7 years old. Note the numerous 'V' for victory signs at the top of the picture. Elizabeth Harwood was an internationally renowned soprano who studied at the Royal Manchester College of Music between 1956 and 1960. Further information about her life and the collection of papers held by the RNCM Archives can be found by clicking the link to the Archives Catalogue on the right hand side.